Flood damage from rivers in Europe will more than double to about 15 billion euros ($19 billion) per year, even under the most optimistic planet-warming forecast, said a study published in the journal Climate. In the best-case scenario, average warming is contained to 1.5 degrees Celsius (2.7 degrees Fahrenheit), and the number of people affected by floods rises 86 percent to an estimated 650,000 per year, said the authors. In the dreaded scenario of a 3 C-warmer planet, projected flood damage for Europe shoots up 145 percent to about 17 billion euros per year, affecting some 780,000 people—a much largest increase of 123 percent. The world's nations committed in the Paris Agreement inked in 2015 to limit average global warming under 2 C—while aiming for an aspirational 1.5 C—over pre-Industrial Revolution levels. Under the historic pact, countries vowed voluntary cuts in planet-warming emissions from burning coal, oil and natural gas for energy. Scientists say Earth has already warmed by a full degree on average, and that, even if all nations fulfil their pledges, it will warm by at least 3 C.
The European Commission's Joint Research Centre took part in the latest research, which collated data from multiple modelling tools. Floods are already among the most costly natural disasters affecting Europe. Their impact has been boosted in recent decades by growing cities and populations. Climate change is likely to alter rainfall patterns, with a warmer atmosphere able to hold more moisture, released as rain or snow. Accurate projections of the rate of change are crucial for risk planning. "This work confirms that the impacts of global warming on river flood risk in Europe are widespread and often significant," the study authors wrote. "Our results show that substantial impacts can be avoided by limiting global warming to lower temperature thresholds. However, a considerable increase in flood risk is predicted in Europe even under the most optimistic scenario of 1.5 C warming." In Paris, the Seine peaked Monday at more than four metres (13 feet) above its usual level. 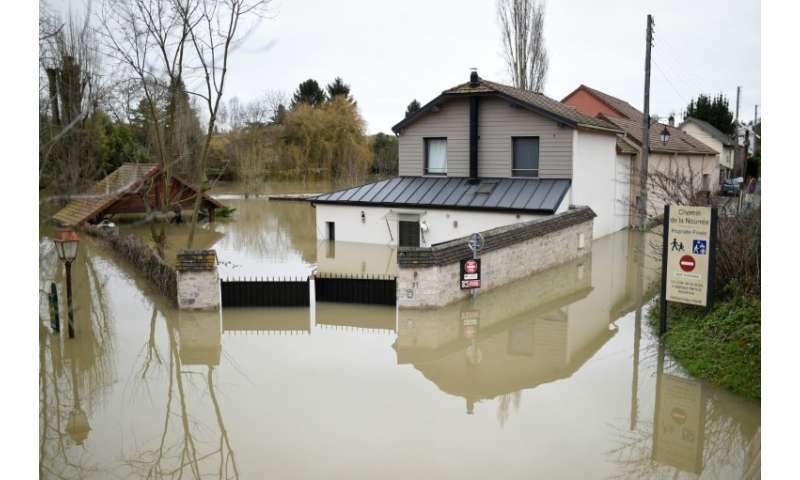 According to the Meteo France weather office, some 282.5 millimetres (11 inches) of rain fell in France in December and January—the highest two-month average in at least 59 years. Mayor Anne Hidalgo on Sunday cited the 2016 and 2018 Seine surges as evidence of the need for Paris to "adapt" to the risks of climate change. Earlier this month, a study in the journal Science Advances warned that within 25 years, global warming will expose millions more people around the world to river flooding—particularly in the United States and parts of Asia, Africa, and central Europe.